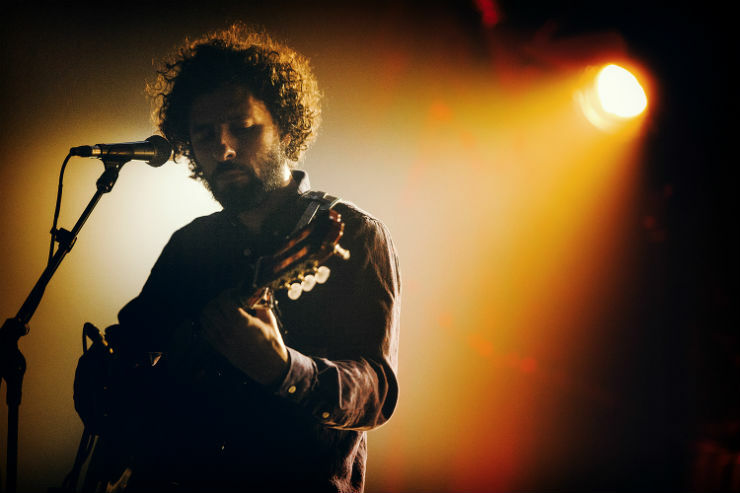 The mood was jubilant for José González' sold out Sunday night set at the historic Théâtre Corona in Montréal. González is currently touring his latest album, Vestiges & Claws, which was released after a seven-year gap since his last solo release. The tour's North American dates are almost all sold out. Starting the night was a set from Icelandic singer Ólöf Arnalds, whose powerful, traditional folk vocals boomed out over the mostly receptive crowd. Alternating between her classical guitar and the intriguing, harp-like sound of a charango, her songs, while subtle, were weird enough to keep the crowd interested. She appeared a bit nervous onstage, but made some witty quips to keep the mood light. González and his four-piece band took the stage almost an hour after Arnalds had curtsied off into the wings, which built up even more anticipation for his appearance. When he finally strode onstage, humble and very relaxed, the noise of the crowd was deafening. He began with a brooding version of "The Stories We Build, The Stories We Tell," off his latest record, and then moved into a beautiful set that spanned his whole discography. His band sounded absolutely comfortable and polished with every turn. González has consistently shown a penchant for working unique covers into his sets and recordings, and his version of Kylie Minogue's "Put Your Hand On Your Heart" was particularly memorable at this show, as his backing band provided intricate harmonies that stunned the ear alongside the finely tuned percussion section. González' talent for arranging his previously recorded material for the stage is immeasurable. The antique-wood construction of the Corona provided excellent acoustics for the timbres of González set. It was refreshing to be able to hear the details of his finger-picked classical guitar, the tasteful percussive accompaniments and nearly every sung word, which seems a rarity in these days of louder and louder shows. This intimacy was heightened when he played three songs on his own, including the massive crowd favourite "Crosses." González maintained a degree of mystery throughout his set, avoiding the typical cliché banter of indie shows and opting to simply guide the crowd on a journey with his down-to-earth music. The highlight during the end of his main set was the sprawling "What Will," on which the band effortlessly flowed through multiple changes in time and feel, including some very groovy Afro-Cuban sections. After uproarious applause, González and band re-appeared for an encore, and they opened with a cover of the Velvet Underground's "I'll Be Your Mirror" featuring Arnalds, who Gonzalez invited back onstage. The band closed the night with a huge, uplifting version of "Leaf Off / The Cave," which, with its lofty refrain of "Let the light lead you out," made the Sunday night congregation at the Théâtre Corona feel a lot like church, if a really fun church.